First appearing to me when I was a child, it rattled past the ornament box I’d come to claim from a dark corner of our garage. Only bones. Its back curved gently along the spine, its toes landing with a soft tap as it walked, stilting, no skin on anything. Even the tail was bare, white, hard. It had a shyness mixed with urgency, wanting something. 30 years later I still don’t know what. Part of myself moved with that creature. I never told anyone. Alive and not. It still comes when I call. I don’t talk about that, either. This is an exactly 100-word flash fiction piece for a tradition of writing ghost stories on Christmas Eve. We acknowledge a sinful and hopeless world, and welcome the dawn in full awareness that Christmas day brings us light. Advent Ghosts 100 Word Storytelling is put on by Loren Eaton at I Saw Lightning Fall. See other entries there. Note: I regret being unable to provide attribution for the photo. This is as close as I could get to the source. “We hardly look at the stars anymore or even the lanterns we hung centuries before to blot out the night from our sight. The wind whistles down empty city streets whose cratered and pocked surfaces betray their long lack of use. Commerce of both the legitimate and illicit type takes place in the light-strung skyways linking the megopolis’ highest spires or in the metro tunnels beneath the ancient pavement or through the indecipherable network of hand-carved caverns chipped out by generations of subterranean squatters. But only the moneyed or mad or desperate or damned venture out much anymore. Even infants get socketed, and once you’ve pegged in to the Lattice, slipping the thumb-sized plug of hyperconductive alloy into the surgically installed socket between your C1 and skull, then you see it. The vast digital distraction sends its digital shivers shuddering down your nerves, a distraction bespoke and beautiful—at least until the signal bleeds or the power grid surges. Then the lights go out, and a district seems to shudder, to rouse itself, to move as a great beast wakened from slumber. Doors open onto balconies. Blinking forms peer out into hallways. Children scamper off into the shadows, scavenging up scraps with which to mock physical forms of their digital simulacra. And wide-eyed, jack-scrambled wanderers stagger this way and that, saying they saw those crude golems move. Join us here tomorrow for Esse Diem’s offering this year, then swing over to Loren Eaton’s blog, I Saw Lightning Fall, to find links to all the 2018 stories! When she was out of town, he slept with Jack..
An unexpected, steady thump. Had she made it home? Christmas Eve. Flipping on the light, he rolled over to see the last wag. His companion’s body went rigid, he lifted his head, his ears flat against the skull. Beyond the window there was no car. No footprints. No one. Just the snow. The animal stood, emitting a nearly silent howl, sound he felt in his stomach. Jack leapt off the bed, his face to the wall. His trembling body was the only sound now. Welcome to Advent Ghosts 2016, the eighth annual shared storytelling event at I Saw Lightning Fall, Loren Eaton’s blog about “narrative, genre, and the craft of writing.” For the uninitiated, Advent Ghosts seeks to recreate the classic British tradition of swapping spooky stories at Yuletide. However, instead of penning longer pieces, we post bite-sized pieces of flash fiction for everyone to enjoy. In 2012, I decided to try Loren’s model of writing one piece inspired by secular Christmas traditions, and another from sacred texts. “Unwanted“ explores the terror we feel when an unexplained and damaged presence penetrates the safety of our families and our homes. “For Later“ is my take on what I’ve always seen as a poetic and disturbing element in the gifts of the three kings to the baby Jesus. I again used a sacred story’s inspiration for 2013’s “Vacancy.” I’ve always had a fascination with the innkeeper from Jesus’s birth story. I fantasize about a moment in which the larger narrative clicks for him, as it did for shepherds and kings. 2014 found me writing about the last heartbeat of a last creature. As natural as it would be, the feeling of loneliness in even a non-human animal felt very real to me that year. I took a break in 2015. Before Loren took the reins over the more graphic content, I was feeling out of place with the tone of some of the pieces. But this year, I’m back. I love the restriction of the 100 words — no more, no less — and how it pares down the writing to something essential. No frills! Plus, there’s nothing quite like being part of reviving a lost or fading Christmas tradition to get my inner nerd all a-tingle. Charles Dickens, I love you. Enjoy this year’s submission, which will post not long from now, and if you like creepy little tales be sure to visit Loren’s blog, too! Just when I think I’ve read the most shiver-inducing tale, they get, well, more shivery! If you read this blog regularly, you know I’m a big fan of the 100-word flash fiction model. It creates a structure that imposes discipline, as does the sonnet. There are rules. My process is to keep a tight leash on my sentences but not self-edit much in the draft phase. The fun comes when I do a word count and have to start paring down, replacing, refining. There is an effort to collect 100-word stories on this site, 100 Word Story. I will share Eric’s full Halloween 2015 round-up on Esse Diem on or after Friday, October 30. I hope you enjoy my story. I’ve always been fascinated with how simple curiosity can morph into obsession and losing touch with reality. I’ll leave the rest unsaid. 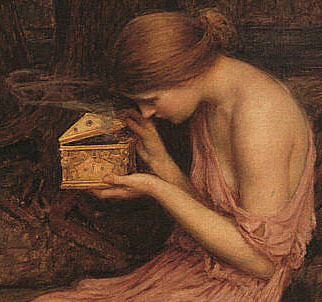 John William Waterhouse, Psyche opening the golden box , 1903. It was a place to hide treasures. How what she considered “treasure” changed, she couldn’t remember. Things from the woods behind the house, the path to school. First leaves or seeds, but soon feathers. What once had a heartbeat. Claws, then tails, whatever could be preserved. That Halloween, the treasures were recent. “Who’s next?” Seth held a flashlight under his face in the dark. No, she thought. It’s so much better. Earth was silent, dark, dense beneath the enormous frame. 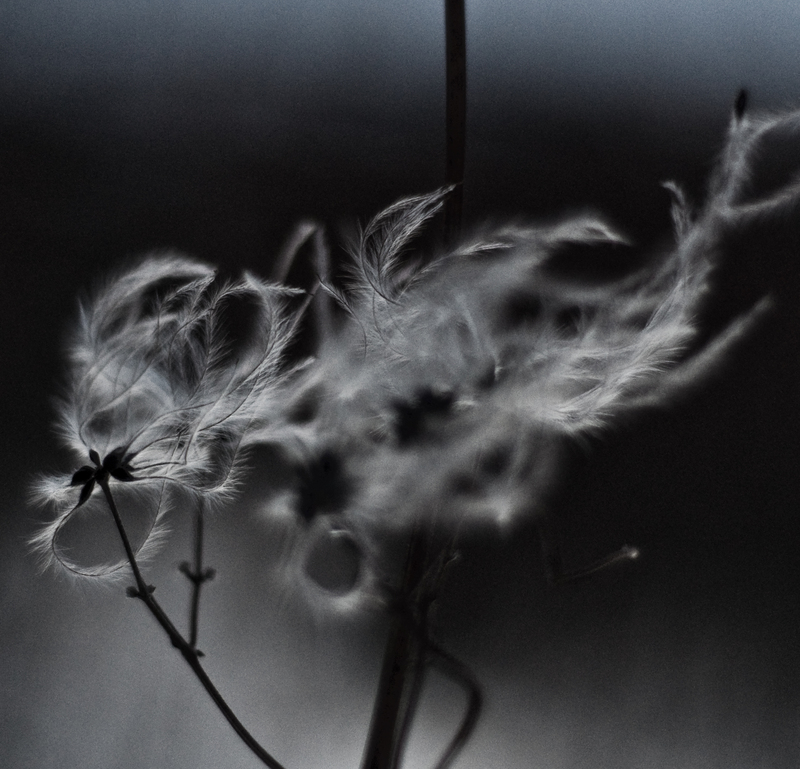 Heartbeats grew further apart, the slight tremor of ice shards like glass in long lashes and shaggy coat. A dozen bitter winters, this the first when it is too much to stand. An eyelid raises, cracking its frozen seam to see a bright line in greenish-yellow against the sky’s ink. No sound or scent of footed life, only the patient gathering scrapes of talon and wing. The eye is open, the chest is now silent. He draws a breath. The circle tightens. The sky’s line glows. Is any season lonelier than solstice? The elements shove the sun over the horizon, force the flora into the earth, drive animals deep into their dens. And what of us? 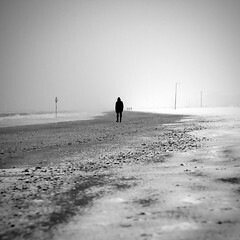 We contend with old paths turned treacherous by ice. 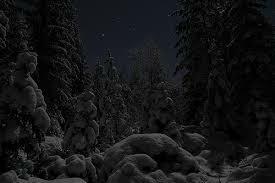 Well-known tableaus have gone foreign, hills hoary with frost and trees stripped down to bare boughs. Spare a sigh over goldengrove unleaving, just one while rubbing aching knuckles and flexing numb toes, face ruddied to rawness by the cold. Then go home to shelter and faces known — if not always friendly. The half-full bottle hidden beneath the sink. Bills shoved to one side of the desk. Those hard words muttered in still moments. Breathe in the tired smells of stale coffee, damp cigarettes, and aerosol air freshener. Then pause. The air holds a hint of wood smoke as fire flares up in the hearth. The house creaks, wind whipping around the eaves. Tinsel glitters in the dim light. The person sitting across from you smiles tentatively. Starts to speak. Hesitates. The silence, filled as it is with the ghosts of old arguments, is deep. What will you say to break it? We have some fun each year. Personally, I go spooky but never gory. Reflecting on my previous offerings, I can see I use a lot of ambiguity to drive an unsettling mystery. Those are the tales I prefer. But the canvas is wide. I hope you will consider joining us this year! 2014 . . . Coming December 19!